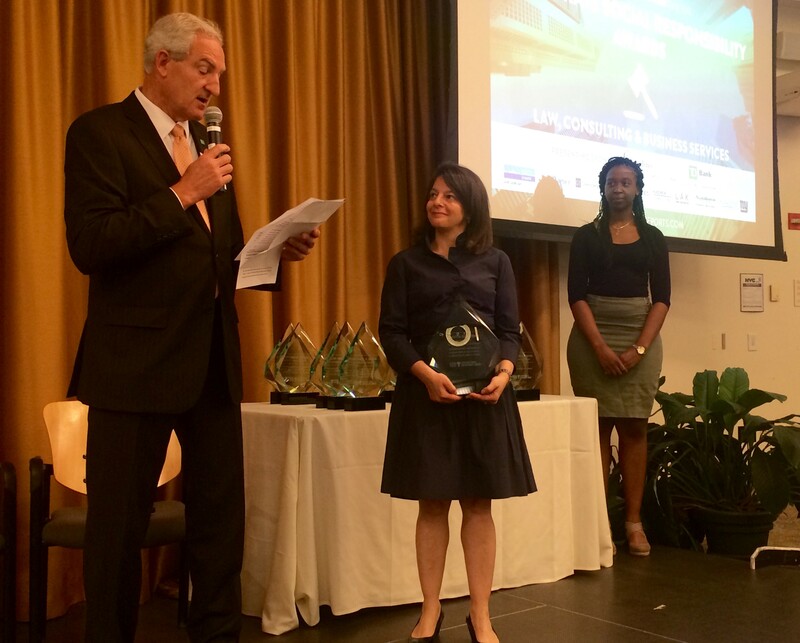 April 24, 2015- Capalino+Company is proud to support City&State’s Corporate Social Responsibility (CSR) awards, which hosted its second ceremony to honor leaders in New York’s Law, Consulting and Business Services sector on April 22, 2015. The breakfast ceremony, which took place at Baruch College, included a “Thought Leadership” panel and an award ceremony emceed and moderated by Fox News correspondent Arthur Aidala. Jack Rainey of TD Bank kicked off the program by presenting awards to the honorees. Judith Gallent, Partner at Bryan Cave LLP and Head of the Land Use Team, was recognized for her Distinguished Service in the Promotion of Educational & Non-Profit Institutions. Also honored was Peter Neger, Partner at Morgan Lewis, who received an award for Outstanding Leadership in the Promotion of Education and Public Service throughout the New York Region. 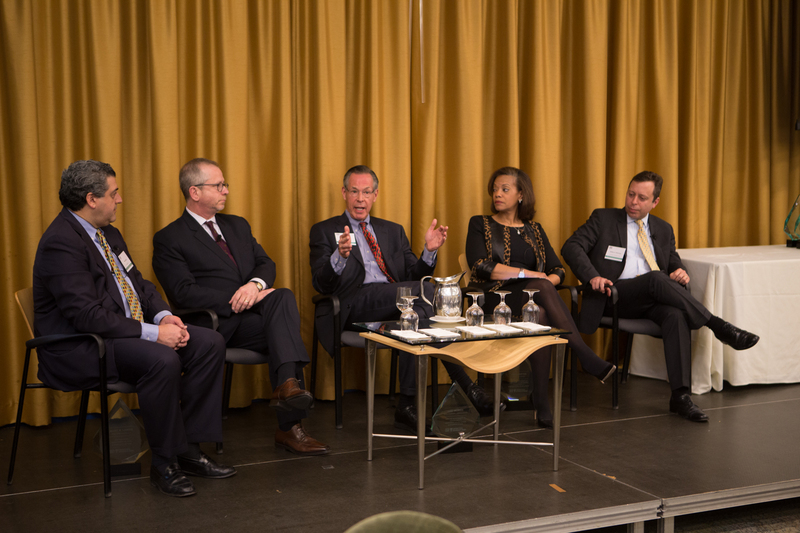 Arthur Aidala moderated a thought-provoking panel discussion featuring award winners from both large and small firms in a range of industries including law, education and public relations. Peppered with questions from Aidala, each panelist had a unique take on what is required to do CSR well, leveraging their knowledge of engagement strategies and community partnerships to make the case that we have a duty to give back to our community. Despite coming from both large and small firms, the panelists were in agreement that successful CSR efforts are not necessarily dependent on coming from a big firm with massive resources. “It doesn’t really matter what size your company is. What matters is having engaged people who really want to drive that mantra of building a better working world,” said Angela Spencer-James, Tax Principal at Ernst & Young, speaking on behalf of Kate Barton, who received the Lifetime Achievement in Corporate Volunteerism, Philanthropy & Organizational Development. Joining Angela on the panel were Marc Landis, Managing Partner at Phillips Nizer; Eric Mower, Chairman and CEO of Eric Mower + Associates; William Silverman, Shareholder at Greenberg Traurig, LLP; and David Birdsell, Dean of Baruch College’s School of Public Affairs. “Attorneys have a particular advantage and particular responsibility [to CSR] because of our common law system, where the things we do set a precedent that benefits many other people in addition to the case you’re working on at that moment. That’s why it seems logical and sensible for attorneys to step up and take on that particular burden,” said Mark Landis, Managing Partner at Phillips Nizer. This innovative breakfast was the second ceremony in a series to honor CSR efforts in a variety of sectors, including Technology, Banking, Hospitality, Sports and Retail. The first event, which took place on March 31st, honored leaders in Real Estate, Housing, and Construction. The winners were chosen by the public following a nomination process on City&State’s website. For detailed coverage of the first event, check out our blog post. To see the full list of honorees and their awards, read our blog post CSR Award Ceremony Announced for Law, Consulting and Business Services.